When I find Original Thinkers in the Markets, I read everything they write. Philip Treick and Rob Mullin of Tocqueville Asset Management are two such Original Thinkers. Like me, they have a tight mandate in the resource sector, but I’m always intrigued at their stock picks and market views. In their last note to unitholders, they outlined just how cheap and under-owned resource stocks really are, compared to any other time in history. (I knew they were cheap by looking at my own portfolio, but I didn’t know they were THIS cheap.) With their permission, I am sending you a 2-part precis of their letter that lays all the facts out on the table. For the third time in our resource focused careers (the others being 1999 and 2008) it feels like investors are willfully ignoring signs of resource sector recovery as inconvenient and temporary. Our read is that it is a typical cyclical low which offers those willing to invest as value-focused contrarians an exceptional entry point. We have argued for some time that natural resource equities are quite cheap, both on an absolute basis and relative to the overall market. Resource Equities provide diversification relative to the broad equity market, and that benefit increases over longer time horizons. Resource equities not only protect against inflation but significantly increased purchasing power in most inflationary periods. 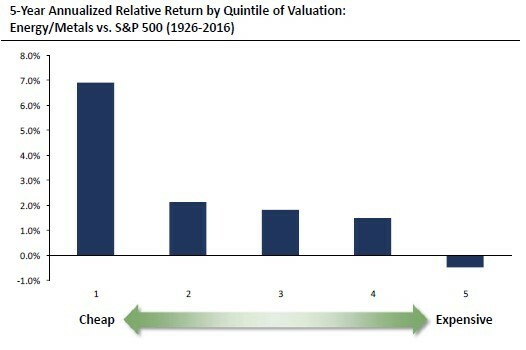 By some valuation metrics, resource companies appeared to trade at their cheapest valuations relative to the S&P500 in almost 100 years, and if history is any guide their future returns may well significantly outpace the performance of the broader market. 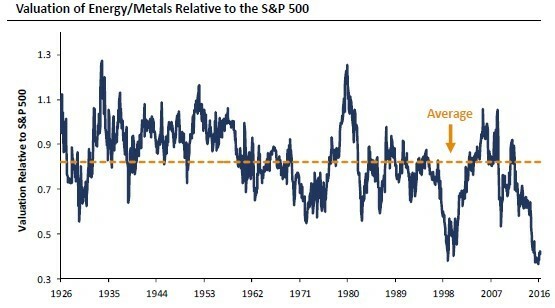 The two charts immediately below graphically illustrate point #3, as it showed natural resource stocks had only been this cheap relative to the rest of the market once since 1926. Further, the typical average annualized return of the sector relative to the rest of the market from levels like this have averaged 700bps a year for the following 5 years (2nd chart below), a huge number in an assumed low-return environment like we have today. Since this chart was published 18 months ago the acceleration of natural resource cash flow and earnings have significantly outpaced those of the broader S&P 500. Energy earnings and cash flow have roughly doubled since then, and materials have risen 35% and 18% versus gains of 8% and 1% for the broader market* while resource equities have broadly underperformed. This leads us to believe that relative valuations have likely fallen “through the floor” to even lower lows. Investor Exposure to Resources, How Low Can You Go? Despite the attractive characteristics mentioned in #1 and #2 above (and likely due to the perceived irrelevance of diversification and inflation protection in the current market environment), investor allocation to resource equities has continued to fall over the last several years. 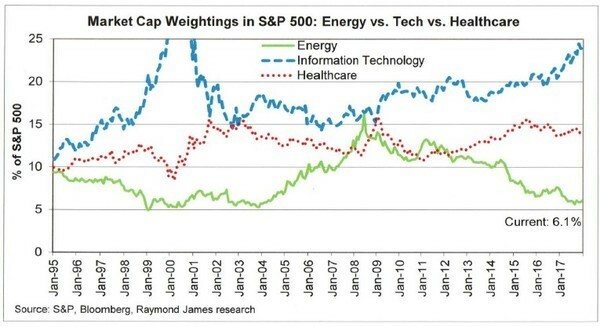 The S&P 500’s exposure to energy and resources has fallen by 60% over the last decade and now sits right on the 25-year low. The MSCI All Country World Index has shown a similar trend. It is our understanding that what little allocation there is to natural resource assets from pensions/endowments is highly skewed towards energy infrastructure and credit, with very little allocated to liquid public equities in the sector. This in many ways would explain the recent underperformance of commodity stocks, and would imply considerable incremental buying power should attitudes toward the sector reverse. The most recent cycle has been typical in many ways. High commodity prices which peaked in 2011-2014 drove innovation, higher capital expenditures and resulting overcapacity. Subsequent sector underperformance led to investor underweighting, which inevitably elicits the return of commentary that “it’s different this time” and will never recover. By at least one measure which is charted below, this underperformance of commodities vs. stocks is reaching cyclical lows almost precisely matching ’99 and ’08. 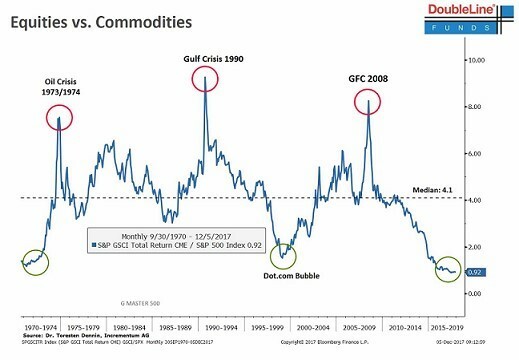 Worth noting is that this chart was cited as support for the “favorite trade of 2018″ by Jeff Gundlach of Double Line, a notable choice for one of the largest and most successful fixed income managers in the world. At each of these lows there were reasons put forth that posited a “new world” where demand would never recover as justification for permanently avoiding the sector. In the early 2000’s the Economist declared “The End of Oil” with the coming technological wave of hydrogen fuel cells and bioethanol. At the time the world consumed 70 million barrels per day. It is now closer to 100 million.